Women’s fashion has been held to constraints and laws governing women’s bodies throughout most of human history. Thanks goodness we live in a more modern era, one that allows women more wiggle room (pun intended) on what they can wear…not only for outerwear, but for lingerie and shape wear as well! Not too long ago, there were laws that mandated what females should wear underneath their outfits. 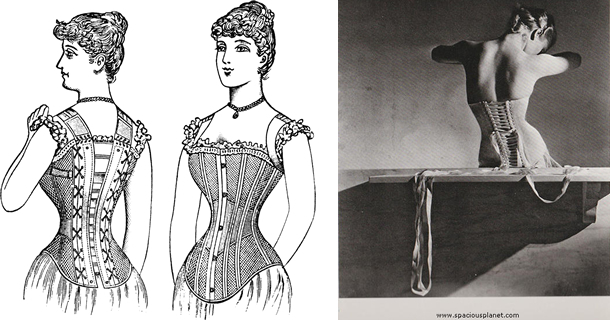 Most ladies were instructed by society to wear corsets outside of the home, everywhere they went. No matter the season or the occasion, a girdle and cinching corset were not only considered acceptable as the norm, but upheld by law! I found this gem while doing background research: “In Norfolk, Virginia, a woman can’t go out without wearing a corset.” (There was a civil service job -for men only- called a corset inspector.) Missouri seems to have the oddest laws concerning women and their lingerie. It seems that, depending on where you lived specifically in the state, different rules could apply to you at one point in America’s history. In Maryville, Missouri, women are prohibited from wearing corsets, because “the privilege of admiring the curvaceous, unencumbered body of a young woman should not be denied to the normal, red-blooded American male. '” How dreadful! This text clearly shows the common (albeit probably mostly male) belief that women were no more than objects to be gawked at, and women’s natural body shapes were to be on display at all times, for the amusement and visual delight of “red-blooded” males. So the naturally “curvaceous” shape of a woman was considered pleasing in that town. What about elsewhere in the state? The extremely fundamentalistic attitudes of many small-town religious leaders often prevailed – hence, we find laws governing the wearing of corsets, nightgowns, shoes, and hats. Doctors practicing in Long Beach, for example, seem to have a special social responsibility. An unusual piece of loony legislation says every woman must “be found to be wearing a corset” when attending any public dance. A physician is required to inspect each female at the dance. The doctor must ascertain that the woman is, in fact, complying with this archaic law. I guess the town physician poked and prodded every belle of the ball that waltzed in the door. Obviously, this text is outdated. Most women today can choose what they wear – especially their undergarments – and are empowered by their freedom in their clothing selection. Ladies, feel free to wear corsets if, and when, the occasion calls! Corsets today are a magnificent mix of traditional fashion with a modern twist – especially since many corsets today are made to be seen and some can even be worn as outerwear (or under a blazer or long-sleeved top. Know of any other funny or strange laws about lingerie? Leave us a comment below, tell us on our Facebook page, email me, or follow us on Twitter! while attending a lingerie show the girls tell me that it is ca. state law that they must wear pantyhose under their lingerie and I would like to know if this is true . I also heard that in bikini bars the girls also have to wear pantyhose under their swimsuits ( the same suits that they can wear on the beach without them ) is this the same law or is this a figment of somebodys imagination ??? hi Rob! That is actually hilarious, I’ve never heard of that before! Does anyone else have the answer for Rob about this bizarre lingerie law? Hello! Great website. There seems to be an issue with this article, in that there is no “Merryville, MO” that I am aware of. There is a Maryville, MO, but has no ordinance regarding corsets. Further research only comes up with the same quote as regarding the law, but never a citation. Can you clarify? Keep up the good work! Thank you for the insight. We did update the name of the city as per your suggestion. This article was written almost 8 years ago, and unfortunately we don’t always look back at previous posts. Perhaps this law has changed and we will do our best to look into it to find more information.